Abuja — The Nigerian National Petroleum Corporation (NNPC) yesterday disclosed that the alleged unwholesome activities of cross-border smugglers of petrol in border states across Nigeria had now forced it to record a daily under-recovery worth N774 million in its importation and distribution of petrol in the country. NNPC's Group Managing Director, Dr. Maikanti Baru, stated this at a meeting with the Comptroller General of the Nigerian Customs Service (NCS), Mr. Hameed Ali, in Abuja at the weekend. A statement from the Group General Manager, Public Affairs of the corporation, Mr. Ndu Ughamadu, contained Baru's conversation with Ali. In it, Baru raised the alarm that the proliferation of fuel stations in communities with international land and coastal borders across the country was affecting NNPC's capacity to supply petrol to cities in the country as well as its financial bottom-line. Baru insisted that this development has energised unprecedented cross-border smuggling of petrol to neighbouring countries, and making it difficult for the corporation to sanitise the fuel supply and distribution challenges Nigeria has. He said detailed study conducted by the NNPC showed a strong correlation between the presence of the border stations and the activities of fuel smuggling syndicates, and that this had led to NNPC's observed abnormal surge in the daily consumption rate of Nigeria and evacuation of petrol from less than 35 million litres per day to more than 60 million litres per day. This, he added, was in sharp contrast with established national consumption pattern. He also provided a detailed presentation of the NNPC's findings, stating that 16 states in the country have among them 61 local government areas with border communities and 2,201 registered fuel stations which have a combined fuel tank capacity of 144. 9 million litres of petrol. Baru further explained that eight states with coastal border communities spread across 24 local government areas in the country accounted for 866 registered fuel outlets with combined petrol tank capacity of 73.4 million litres. He said because of the obvious differential in petrol price between Nigeria and other neighboring countries, smugglers now found it lucrative to use these border stations as conduit for the smuggling of petrol to neighbouring countries. According to him, this had resulted in a thriving market for Nigerian petrol in all the neighouring countries of Niger Republic, Benin Republic, Cameroun, Chad and Togo and even Ghana which has no direct borders with Nigeria. 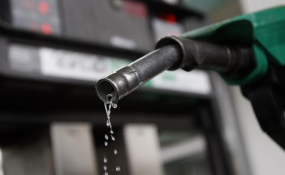 "NNPC is concerned that continued cross-border smuggling of petrol will deny Nigerians the benefit of the federal government's benevolence of keeping a fix retail price of N145 per litre despite the increase in PMS open market price above N171 per litre," said Baru, who noted that based on the heightened petrol consumption rate of 50 million litre per day, the corporation was incurring an under-recovery of N774 million every day. The statement also quoted Ali to have said the customs would work with the NNPC to stem the tide of cross-border smuggling of petrol. Ali equally called on the government to address the issue of price differentials which he reportedly said was the underlying motivation for the smuggling of petrol from Nigeria across to neighbouring countries. NNPC's further breakdown of its findings, stated that among the states with land border, three local government areas in Ogun State accounted for 633 fuel stations with a combined petrol tankage of 40.4 million, while nine local government in Borno State have 337 fuel outlets with combined petrol storage capacity of 21.1 million litres. In Lagos, NNPC said one local government that has a border community has 235 registered fuel stations with total petrol storage facility of 19.9 million litres, while on the coast of Lagos, six local governments with border communities have 487 registered fuel stations with combined in-built storage capacity of 50.2 million litres. In Akwa Ibom State which has five local governments with border communities, NNPC said there are 134 registered petrol stations with capacity to store 8.3 million litres of petrol, while Ondo State has two local governments that have border communities and 110 fuel stations that can store 3.8 million litres of petrol.